How important is risk correlation: If risks are correlated vs. not correlated how does it affect results? This is really a “it depends” question. Correlation means that if one risk occurs then it will trigger another to occur. It can be somewhat more complex than this especially if the correlated risks have different probabilities; however, for this discussion we will just keep it simple. What our own research has shown that risk correlation only has statistically significant impacts on simulation results if the correlation is 100% and the probabilities are relatively high. Because of these findings, in RiskyProject our correlation is binary, either 0 or 100%. We believe this provides an accurate modelling without adding undue complexity to the models. Therefore, advice is that if you have two important risks that are correlated, then correlate them. Otherwise, use correlation with caution. 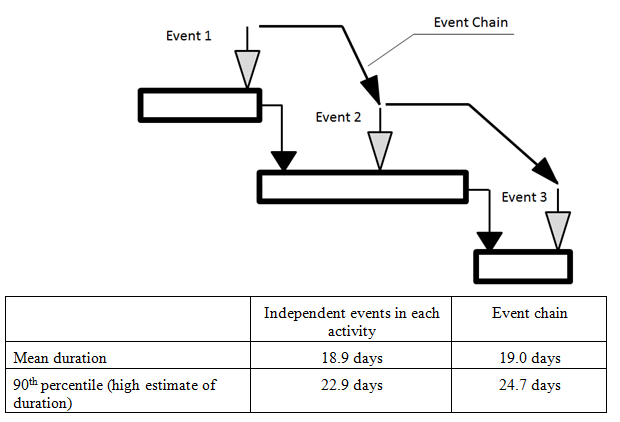 The example below illustrates the difference between event chain and independent events. Monte Carlo simulations were used to perform the analysis. The project includes three activities of 5 working days each. Each activity is affected by the event “restart activity” with a probability of 50%.